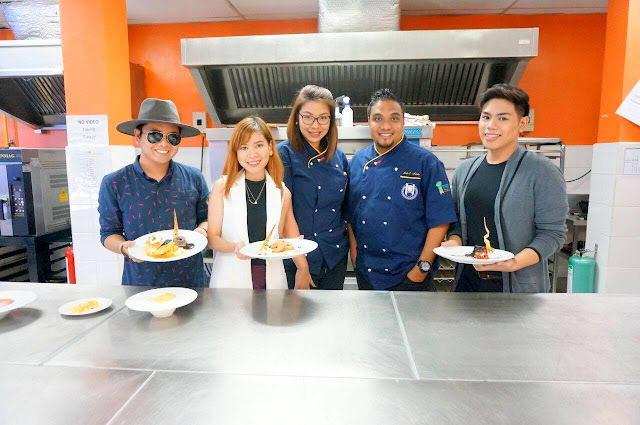 The International School For Culinary Arts and Hotel Management a.k.a ISCAHM has been offering good quality of education for the Kapampangans for the past few years after its successful foundation in Manila and in Cebu. Pampanga, known to be the Culinary Capital of the archipelago was a very good choice of new location for this training centre. Located at Angeles City, Pampanga former location of Batis Asul is really accessible for the people living in the province who use private vehicles or PUJ as their mode of transport. Last May 14, ISCAHM had their open house in Pampanga to let the people know about their programmes and other things to give to the Kapampangans. I was stoked by the things I never thought this school has to offer. From the numerous awards and recognition they got from different Culinary competions in the country and outside the Philippines as well. They always go home triumphant in every activities they join. Their world class Chefs/mentors are really approachable and much respected in their field who never get tired of imparting the wisdom they have for the students who aspire to become like them in the near future. Moreover, as a Hotel and Restaurant management graduate, somehow I had ideas about the things they did to put up an event like this. I was flabbergasted to see the professionalism of their students assistant when they served us quality foods and a very good remarkable service. We were given a chance to have an ocular visit in their laboratories. Had the chance to see the students on how they listen and respond to their mentors. Chef Norbert Gandler, the executive director for culinary and pastry education gave a warm welcome for the guests and delivered a short speech about how they established ISCAHM way back in 2003 in their first branch in Katipunan. In a ddition to that, Chef Gandler also announced the newest programme they have which is the Senior High School. They have Grade 11 which offers the Core subjects and Applied Track Subjects and of course a Spcialized subject (Cookery NC II) on their First Semister as well as on their Second semister with different core subjects. Furthermore, their Grade 12 programme offers specialized subjects such as Practical Bread and Pastry Production NC II in their First Semister and Cookery NC II Assessment and Work Immersion in their Second Semister. ISCAHM boasts of a faculty roster of professionals and reputable local and foreign industry veterans and practitioners committed to quality education and focused on providing students with excellent learning opportunities. After the short talk, the guests were able to indulge themselves from the delectable foods prepared by the ISCAHM Community. SHS graduates can earn(2) TESDA NCII certificates. After graduation, those who would like to further pursue culinary or pastry training are privileged to apply for the 8-month shortened diploma and the Australian Certificate III. The Australian Certificate III is issued by the Culinary Solutions Australia and is recognized by the Australian government and the Commonwealth Nations. Earning this certificate signifies successful completion of Australian competencies, which adds credit to and upgrades an individual’s qualification as a kitchen professional. Like what they always say, Train with the Champions! Music to the ears, right? "We make sure that your passion and dedication get recognized by providing you with world-class culinary and pastry instruction and training. We hold an unparalleled record of producing graduates who have excelled in the dynamic and exciting industries in the field of culinary/pastry arts both in the country and abroad. Start your dream of becoming a chef now with our winning team of chef instructors and mentors." After the Open house, we were privileged to see the final plated dessert made by the students of ISCAHM. Wow, just wow!